A few weeks back, South African restaurant Pinotage closed its downtown branch for renovations, but it’s looking more and more likely that it might not be re-opening any time soon. Africans wishing to curb their home cravings will be happy to learn of the recently opened Nigerian cuisine restaurant, Andy’s Restaurant & Bar. Nigerian is the most populous country in Africa, and most likely one of the most ethnically diverse countries in the world. The population is divided into nearly 21 percent Hausa and Yoruba, 18 percent Igbo/Ibo, around 11 percent Fulani, and 5 percent Ibibio. Various other groups make up the remaining 23 percent. There are so many dishes you can try. Nigeria and West African countries share one distinct feature in their cuisines: spiciness! Nigerian love their food spicy, the hotter the better. The closest comparison would be Sichuan cuisine. Andy’s does not disappoint in the mouth numbing spiciness. The dishes are prepared by Andy, the co-owner and manager of the restaurant and bar. Nigerian born Andy has lived in Beijing and was motivated to start the restaurant after hearing how most of his countrymen and women missed home food. The selection isn’t much, but the dishes he offers pack a punch. The most bland items are rice, garri, and semo. Garri is a one an accompanies dishes and is prepared using cassava tubers. The preparation including molding it with milk that help to cool down the spiciness. Semo is another accompaniment that’s made from grain (or wheat). Egusi with ukazi (RMB 70) comes with the option of picking semo or garri as a side. The Egusi is made from melon seeds that are ground up and slow cooked. The other dishes we ordered were the chicken and beef stew (RMB 80 each). These stews aren’t for the faint-hearted as both were extremely sweat-pouring spicy. We substituted the rice accompaniment with Semo and Garri. 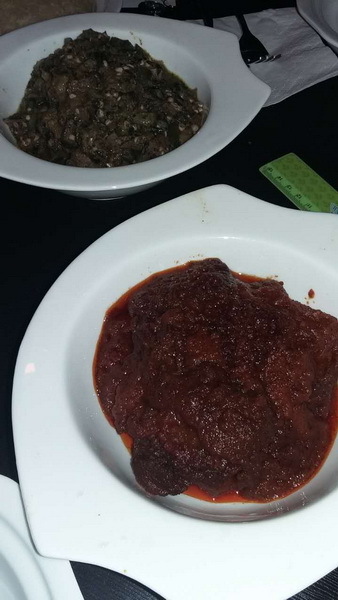 The last dish we ordered was the draw soup with oligbo (RMB 70) that’s made from Ogbono seeds and Oligbo (bitter leaves) that blended well with the spicy meat dishes. There are also chicken nuggets available that can be good option for kids to nibble on. The restaurant doesn’t have a restroom and you will have to use the ones available at Sanlitun Soho. There are no high chairs or kids’ cutlery available. It’s best to go before 8pm or risk some dishes being sold out while the bar becomes more active. Note: The soups are thick and more like heavy stews. Mon-Sun 11am-Midnight. Rm B1-521, Bldg 5 Sanlitun Soho, 8 Dongsanhuan Beilu, Chaoyang District. (135 2104 4632, 185 1127 1611) 朝阳区东三环北路8号三里屯Soho5号楼B1-521.